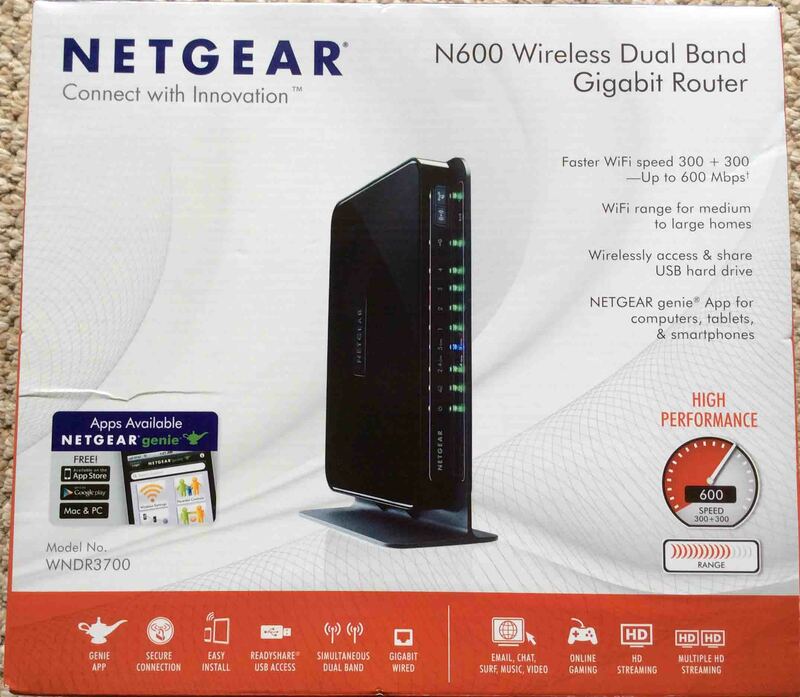 Reasonably priced at around $100, the Netgear N600 wireless dual band router, model WNDR3700v4, has tested out to be highly reliable, almost never requires rebooting, virtually never drops connections, comes with secure configured wifi right out of the box, and delivers stutter-free video and audio streaming throughout small to medium sized apartments and homes. It’s easy-to-navigate web interface supplies browser access to all of its rich set of configuration options, and since its state-of-the-art wifi security is enabled by default, you don’t have to worry about creating an unsecure wireless connection with it. It runs with almost no detectable warmth. Both its power adapter and the router itself run very cool, and NOT because this is a low-power, short-range unit. 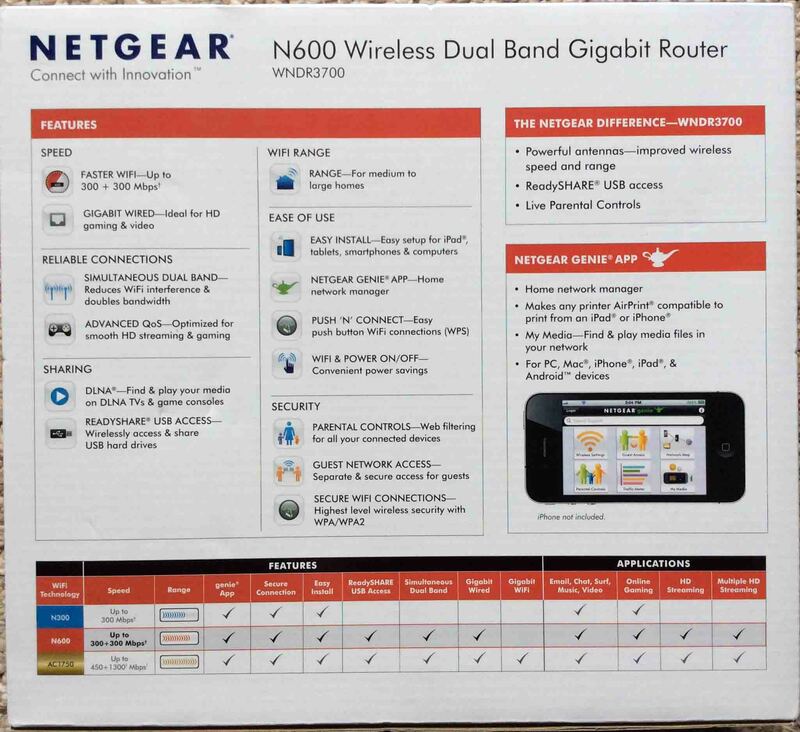 Front of the original carton for the Netgear N600 WNDR3700v4 Wireless Router. Vastly improved streaming performance. Our streaming audio and video devices work markedly better, including DVRs, tablets, smart TVs, and iPhones. IPv6 Support. Can function in an IPv6 network environment. You’ll be ready when the Internet migrates to IPv6; even though this has been, and will likely continue being, a very slow migration. Dual Bands. 2.4 and 5 Ghz. 802.11 AC provided, and it can broadcast on both at the same time (each network has its own SSID). Users can connect to both networks simultaneously. Many Wifi Standards Supported. IEEE 802.11 b/g/n on 2.4 Ghz. IEEE 802.11 a/n on 5 Ghz. Decently Fast Data rates. Up to 600 Mbps throughput on 5 Ghz., and simultaneous 600 Mbps on 2.4 Ghz. Speedier than many of the tri-band 3X3 access points. Medium Range. Both the 2.4 and 5 Ghz. networks have enough range / reach to function well throughout small to medium homes as well as some smaller large ones. WPS Support. Wifi Protected Setup, also known as Push ‘N’ Connect, allows quick connection of WPS-enabled devices to the Wifi network, without having to choose the host network or enter network passwords. WMM QoS support. Quality of Service packet prioritization can be enabled for specific local devices, applications, and / or Ethernet port numbers. Also, Internet QoS is provided, allowing specific applications and Ethernet port numbers to receive user specified prioritization. Guest networks. Features two guest networks that allows people to access other devices on your network as well as the Internet. Access to local network devices can be switched on or off. Configurable guest SIDs are provided for the 2.4 and 5 Ghz. bands (one for each), and they are disabled by default. DLNA Support. Allows searching and playing your media (music and movie files) on DLNA emabled smart televisions and game consoles. Genie Web Interface. Features Netgear’s Genie setup and configuration interface, which makes a breeze, setting up the basic wired and wireless networks as well as configuring the built in network sharing of any attached USB storage devices (ReadyShare). With Genie, you can monitor router status, access the router’s configuration pages from either a wired or wireless device, upgrade the firmware, change wireless network names and passwords, and configure over a hundred network specific parameters. A mobile Genie app is also available. However, for basic network setup, no need to access Genie at all. Automatic detection of available firmware upgrades. The system notifies you when you log into its Genie interface, if a later revision of the router’s firmware is available for download. You can then instruct the router to go ahead and download and install the latest firmware, without having to first download the firmware file to a PC that’s connected to the router, and then upload that file to the router. However, an Upgrade option is still available if you want to install a different version of the firmware than the latest one. Secure Wifi right out of the box. The WNDR3700v4 comes pre configured with password protected and encrypted wifi networks for both 2.4 and 5 Ghz. bands. One network per band. WPA and WPA2 security schemes supported. The default wireless password is unique to your specific router, and is quite hard to crack. So many users may wish to not change the pass phrase, so that the password printed on the bottom of the router remains accurate. Parental controls. Supports blocking of specific web sites, to prevent children from viewing adult content sites. You can also apply categorical filtering. The levels include High, Moderate, Low, Minimal, and None. Scheduled filtering as well as keyword match filtering can also be configured. Security event email notification. The WNDR3700v4 can email a specified email address with messages and alerts, telling of various configurable security events it experiences, as well as its logs. Dual firewall. Both SPI and NAT firewalls included. Resists common malicious attacks. DoS (Denial of Service) attacks are automatically thwarted. USB port. Contains one USB A connector on the back panel, for attaching a USB hard drive or thumb drive, which can then be shared by other devices on the same network, or via FTP or HTTP, on the Internet. File sharing on the Internet. With a USB storage device attached, the WNDR3700v4 can act as an FTP server allowing users on the Internet to access files on that device. Windows file sharing is also supported on the local network. ReadyDLNA media server support. This router can act as a media server, and supports media streaming from the USB storage device to network attached devices that conform to the DLNA/UPnP AV specification. AirPrint support. Makes any attached printer AirPrint accessible, allowing you to print to it wirelessly from your iPad and iPhone. Broad device compatibility. Works with Windows, Android (Nexus, Samsung, Amazon Kindle), and iOS (iPad, iPhone, and iPod Touch) mobile devices. Wifi ON / OFF button. If you wish to temporarily disable wireless operations, you can quickly do so by pressing this front-panel button. Then, you can turn Wifi back on without having to wait the entire boot-up period of time. Turning Wifi off, essentially converts this router into a 4-port gigabit switch, as Ethernet cable connected devices continue communicating through this device with its wireless functionality disables. Easy initial setup. For basic wireless setup, you can simply unpack the router, attach your WAN, LAN, and power cables, and turn the router on. For WANs requiring no user Id and passwords, the router connects immediately. Also, the built-in wireless access point immediately establishes a secure Wifi network on both the 2.4 and 5 Ghz. bands. The SIDs and passwords are printed on the bottom of the router. Numerous front panel indicator LEDs. These include Power, Internet, 2.4 Ghz, 5 Ghz., LAN ports 1 through 4 activity, USB activity indicator, Wifi off, and WPS availability lamps. These LEDs blink and change colors indicating the various statuses that this router can assume during startup and routine operation. See the Users Manual for a complete description of these patterns. Minimum compliment of front panel buttons. These include the Wifi on / off and WPS activation buttons. All connections made on the back panel. Back panel ports include the USB, LAN ports 1 through 4, the WAN port (yellow), and the power adapter port. Power adapter included. The unit comes with a 12-volt, 2.5 amp switching power supply. Gigabit network ports throughout. The five back panel Ethernet ports, including the WAN port, are all capable of gigabit data speeds, making this router capable of handling high-bandwidth Internet services throughout both its wired and wireless networks. The ports also auto-detect the speed of connected to them and can slow down to either 100 Mbps or 10 Mbps as required, without throttling back the rest of the system. Power button on rear. The location of the power ON OFF button on the rear of the unit, helps ensure that you don’t inadvertently press it and shut down your network unintentionally. Hefty switching power adapter. The included 12-volt 2.5 amp 30 watt power supply does not sag, even during high-rate, long duration data bursts. Fanless operation. There’s no fan inside to draw in dust; accumulation inside of which can degrade router performance. The heat-generating components seem to be heat synced quite effectively. Very cool operation. We noted virtually no perceptible warming of components. Save / restore system configuration. You can save the current router configuration parameters to a file on your computer, and restore it if you subsequently make changes to the router that “break” it. Two router operation modes. Can be configured as a wireless router (the default configuration), or a wireless access point. The router function provides network address translation (NAT) between your local network and the wide area network (WAN) as well as a WAP, DHCP, and firewall, working altogether as one device. Access point mode turns off the NAT, DHCP, and firewall functionality, and provides you a good quality dedicated WAP when you already have these services running elsewhere on your local network. System logs. The unit keeps a log of routine and error conditions encountered in its memory, that you can access via its web interface. Or, it can email you the log info periodically. Maintains both a general log as well as a wireless system log. Print server support. Can act as a print server, and make an attached USB printer available for printing from wireless devices connected to its wireless networks. Netgear N600 WNDR3700v4 Wifi Router, Carton Back. No external antennas. This limits wifi antenna selection options by the user, and may impede the best attainable coverage and performance somewhat. Requires detachable stand for optimal performance. The router radiates and receives best from its sides. So for table-top operation, where connecting devices will operate at roughly the same distance above the floor as the router, use the included stand to vertically orient the router. The stand may not be required however, when the router is located high above the wireless devices it serves. In this case, lay the router flat, on its bottom side, and do not attach the stand. No multi-user MIMO. The documentation makes no mention of this important feature, in which multiple antennas, transceivers, and ultra-fast internal processors enable this router to support numerous simultaneous users, without stutters, drop-outs, clicks, and freezes. USB support limited to non driver devices. You will not be able to access USB storage devices via this router that require additional or special device drivers be installed. This system only supports basic / standard USB functionality. Single WAN support only. So, no load balancing between different WAN networks available on this router. Non adaptive QoS. The WMM QoS in this router prioritizes network traffic among connected devices and the Internet according to static rules only. It does not change priorities based on prevalence of specific types of network traffic it sees. Some more advanced and higher priced routers however, like the Asus RT-AC87R, do provide this functionality however. No system recovery option provided. Should a firmware upgrade be interrupted or some other cause of firmware corruption occur, no immediate means is provided to restore the router to its previous, working version of the firmware. Note however that firmware parameters can be restored, if you’ve previously saved a backup of the router’s configuration file. Long boot up time. Takes just over two minutes from initial power on, until the unit is fully up-and-running and able to accept wifi traffic. We expected a much shorter boot time, given the two dual-core processors herein. No scheduled rebooting option. Some of the high-end routers allow you to set a time of the day and day of the week, when they would automatically reboot themselves. This clears any slow-growing memory and handle leaks that might be present in the firmware, and generally improves reliability during the up times. We found no such option in the RT-AC87R however. May require rebooting if attached WAN equipment is restarted. To consistently restore full performance to our network, we’ve found that if we reboot our cable modem, then it’s best to also reboot this Asus router. Sometimes the RT-AC87R wifi connection after a modem restart is slow and erratic until this equipment is also cold started. This situation however, will likely improve with subsequent firmware updates to this router. No mention of hardware based network address translation. This could mean slower Internet performance; particularly within high data traffic applications like video surveillance, or video movie streaming services. The Neggear WNDR3700v4 is a reasonably priced and well-performing wireless router among the many we’ve owned. Quite pleased with the purchase. We particularly love the affordability yet high speed and reliability, as well as the extensive Genie web-based administration interface, which gives you highly granular control over hundreds of operational settings, regulating overall behavior and function. The accomplished IT network professional will truly appreciate this router’s plethora of advanced settings and attributes. Yet the novice will marvel at how little must be learned in order to get this equipment up and running initially. Netgear did a wonderful job in this product, catering to beginners and experts alike. Best of all, our wireless devices perform significantly better on this product, than on prior generation 11 b/g only systems. So we’d rate this router at 91 out of 100. 2015-12-28: Added more appropriate tags. 2015-06-23: Added original carton pictures.